Do not write or phone us to ask the age or value of your bike. Also see information at Kurt Kaminer's Headbadge site. Almost all English 3-speeds have Sturmey-Archer rear hubs. Sturmey-Archer was a division of Raleigh, made many different models since 1902, and were still in business until October, 2000. The company was sold to a group of money manipulators who shut it down in hope of making a quick profit by selling off the assets. The Taiwanese company Sunrace bought the equipment, stock and rights to the name and is back in business. 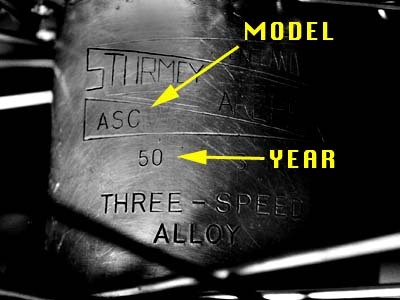 Most older Sturmey-Archer hubs have two or three-letter model codes, which are usually stamped onto the hub shell. Conveniently, they also usually have the month and the last two digits of the year of manufacture stamped onto the shell. This is the easiest way to date a 3-speed bicycle, if it has its original rear wheel. Note: Some of the mid-60's straight gauge 531 frames had serial numbers starting with a single letter which was towards the end of the alphabet. Note: While this numbering scheme is generally true, there may have been some crossover use of letters at the beginning/end of each year (e.g. a "G" serial number may have been built into a bike in 1973, but the frame may have been built in 1972). In 1974, an entirely different numbering system was introduced for the higher end (531 and subsequently 753) Raleighs. Serial numbers should begin with a "W", which stands for Worksop, the facility that produced these frames. This is followed by another alphabet. This alphabet indicates the fortnight in which the frame was built (i.e. A = 1st fortnight, B = 2nd, etc.). The third character is always a numeral. It indicates the year of manufacture, the decade being assumed (i.e. "4" could be '74 or '84; it is up to the interpreter to know enough to tell if the frame is from the 70's or 80's). What then follows is a series of numbers. At this point, these appear to be some sort of sequence, but this has not been substantiated. Digits 6-9 are sequential. Sample is the 123rd bike built that shift. A = morning shift B= evening shift. Sample is morning shift. Letter code may or may not be present, depending on production schedule. The 531DB Gran Sports built in the early 70's did not have letters in the serial number. Frames built at the Ilkeston facility have serial numbers that begin with "SB". The 1973 track frames begin with an "A". There are several documented cases of '73 and '74 Professionals, Internationals, Competitions and RRAs with "A" serial numbers. Let the color scheme, decals and components be your guide.